Inspecting, testing, and maintaining fire sprinkler systems at regular intervals is often neglected. That's a dangerous strategy for facilities managers. Inspecting the condition of the inside of fire sprinkler piping requires system impairment and destructive measures, and a full inspection of automatic fire sprinkler systems at the required intervals is often neglected for this very reason. 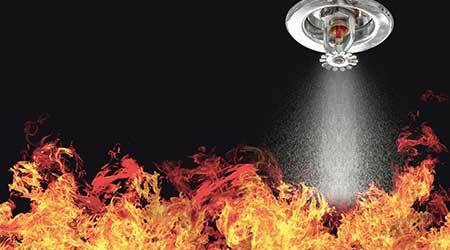 Time alone will degrade the performance of an automatic fire sprinkler system. Leaks and corrosion occur regardless of the type of pipe employed. The roughness of the inside of ferrous pipe increases with time. Accumulation of organic or inorganic materials may occur inside of piping and on wetted components of fire sprinkler heads. These effects of aging may prevent fire sprinklers from activating, and they also increase water pressure losses through fire sprinkler piping. ITM standards address this and require not only inspection of the interior of piping at regular intervals, but also replacement (or destructive testing) of fire sprinkler heads depending upon age, temperature rating, and response element type. How recently has the inside of fire sprinkler piping been inspected in your facility? Are the fire sprinklers due for replacement? Reading the recognized ITM standard may surprise you. Todd E. Smith (todd.smith@rmf.com), PE, CCCA, CDT, is a mechanical engineer at RMF Engineering. He has 26 years of combined construction, design, fire protection, contract administration and commissioning experience on commercial building projects.